Jypyä Pop (Turku, Finland) on 17 November 2012 in Animal & Insect and Portfolio. I like a lot this composition. The diagonal line separates the image, between the water and the rocks with ducks and the dark band at the top is excellent. A great shot. @gerard1948: Thank you. And same to you good week end. Lovely ducks. The green sheen of their heads is especially beautiful. Nice picture. Difficult to belive that it's November in Finland looking at this scene. @Curly: Some days are sunny. Today is the day the cloud. De magnifiques couleurs ces canards. très belle composition!!!! j'aime ton cadrage! Superb composition and beautifl colors ! 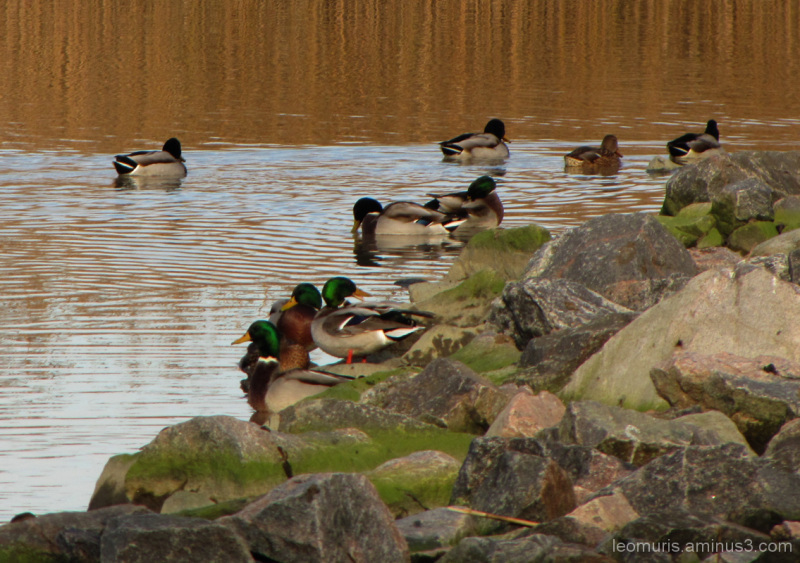 Enjoying themselves, i love that green that the mallard duck has. @The Mouse: Mallard is a popular bird parks. It's almost tame, and it is easy to become a friend. With wild ducks, but not close to the cities. Here they Shrew bun form. @Lopamudra: Hello Lopamudra, it s nice to meet you. Funny that you liked it. Beautiful photo , I like its nice framing. I like the areas in this image. The ducks are fun to see. Avec les reflets dorée en fond quel captage de ces canards. Une composition en Z où la diagonale joue la séparation entre roches et surface aquatique avec au fond le rideau des réflexions qui se lève sur la scène animée.